This is an easiest, quick filling, colourful one pot meal and an ideal lunch box recipe. Wash well and soak basmati rice in water for half-an-hour. Pressure cook for 3 whistles. Keep aside. Cut the roots of the coriander leaves, wash well and chop roughly. Grind together coriander leaves, green chillies and cumin seeds alongwith a pinch of salt, to a fine paste. Strain the paste through a strainer. Keep the water aside. Only the paste is used in this recipe. NOTE: The juice need not be wasted as it has an excellent source of iron. Coriander juice is beneficial in treating nausea, dysentery, urinary infection and indigestion. It also lowers blood sugar levels. You can make a raw juice or soup with salt and pepper. In a heavy bottomed pan, heat oil and butter. Add mustard seeds. When they splutter add urad dal, chenna dal and the whole spices. When they turn golden brown, add the strained paste and required salt. Sauté for a minute. Spread cooked rice in a wide plate, add the sautéed mixture (check for salt and add at this stage if necessary) . Gently turn it around or mix it with your hand without breaking the grains. 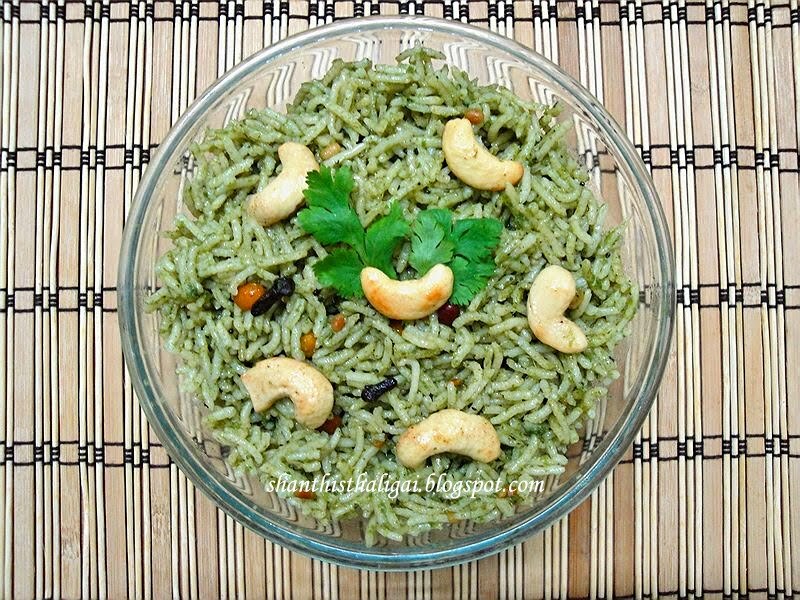 Garnish with ghee fried cashews and serve hot. love the color and it is so refreshing and so simple!! I only make this rice with the regular thogaiyal....nothing fancy about it. Now you have made it party worthy. Well garnished yummy n healthy dish!!! Love this flavourful rice,my fav with chips. Pass me a bowl please Maami. Agreed - perfect for lunch boxes! i love the smell of coriander leaves...very refreshing and aromatic!! I'm sure this pulao will taste good! !